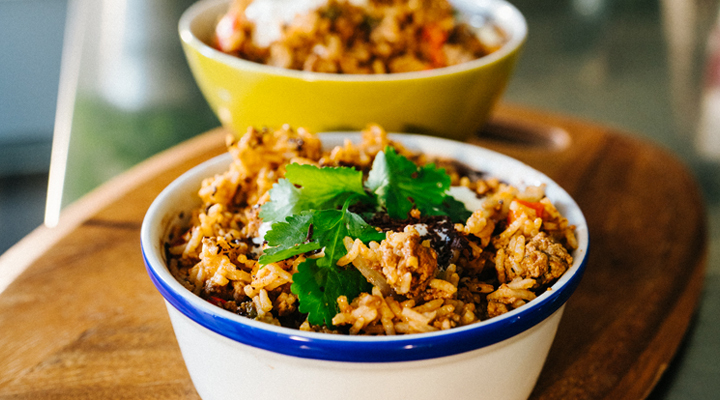 Consider trying something new with our One Pan Mexican Spicy and Chocolate Minced Beef. 1. Heat oil in large frying pan over medium-high heat. Add onion, red and green pepper. Cook, stirring occasionally, for 5 minutes or until starting to brown. Add garlic, smoked paprika, oregano and cumin. 2. Cook, stirring, for 30 seconds or until fragrant. Add the minced beef and cook, breaking up mince with a wooden spoon for 8 -10 minutes or until browned. 3. Add tomato puree, beef stock, ½ red chilli, ½ of dark chocolate. Bring to a simmer. 4. Stir in rice. Reduce heat to medium-low. Cook, uncovered, for 8 to 10 minutes or until liquid is absorbed. 5. Remove form the heat and add dollop of sour cream, fresh coriander, chilli and extra grated chocolate and lime wedges on the sides.